Rachel Ridge pays a visit to Dayanita Singh’s Go Away Closer exhibition at London’s Hayward Gallery and finds a highly original installation that breaks away from the print on the wall mode of display. “Photographs on their own are just not enough. They come alive in a physical form and that form should be changeable,” reveals India’s most renowned photographic artist, Dayanita Singh in a new book Go Away Closer, which accompanies her first UK retrospective, currently on display at The Hayward Gallery. Singh is certainly no stranger to evolving the language of photography; in fact, her lengthy career reads as a habitual search for new ways of reading and presenting images, rendering the classic print on the wall practically archaic. It all began with a love affair with the artist book. Singh was quick to reject the coffee table art book culture for more delicate, highly-collectible and, most importantly, accessible publications. Mass produced publications of hers such as House of Love (2011) and Sent a Letter (2008) - a box of mini photo diaries of her travels in India that open out to accordion folds, line the walls of two gallery spaces in the Hayward. In Singh’s world, book is as important as print - the copy has as much status as the original. Indeed, Sent a Letter sows the seed for self-contained, portable world for photographs, as if her entire career has been leading up to this point – her own photo museum. Displayed in eight 7ft tall, dark wooden structures, called Museums, each cabinet refers to a theme including Chance, Embraces, Men, Furniture and Photography, inviting viewers to engage with the black and white prints contained within, that are each culled from different eras and focus on different subjects. The book, which is essentially a comprehensive documentation of each Museum, includes an essay from renowned writer Geoff Dyer. In one passage from the text, he ventures the following: “Singh treats her images like living entities in perpetual conversation and re-evaluation. The pictures are the time overlooking each other, glancing over each other’s shoulders.” In other words, hidden within each of the structures are images that lie dormant waiting to surface and it is wholly appropriate that as the exhibition runs, Singh will constantly rearrange their ordering. 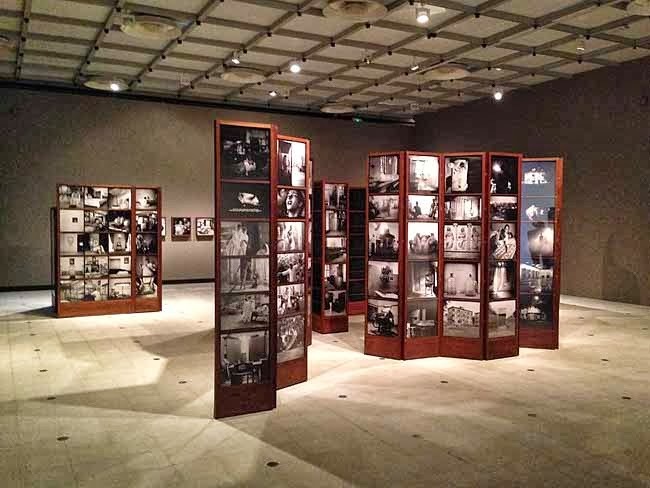 After their London sojourn, these travelling ‘memory banks’ will return to Vasant Vihar, New Delhi to be permanently installed, with a resident archivist to oversee them. They will be open to the public, somewhat ceremoniously, on the first and second full moon of each year. Singh’s highly sophisticated preservation of the medium certainly speaks to the precarious identity of the photograph in our information age. Never a slave to categories, institutions, or the form of the image itself, Dayanita Singh seems to be forever edging towards a new world in which photography to reside. Eti Wade reports back from the opening of the eagerly anticipated new show at London’s The Photographers’ Gallery curated by Susan Bright, Home Truths: Photography, Motherhood and Identity and explores the role and influence of maternal subjectivity in a selection of artists’ work. Standing in the playground on Friday morning, after my visit to Home Truths: Photography, Motherhood and Identity exhibitions at The Photographers’ Gallery and The Foundling Museum in London; looking at all the mums sending their children off to another day at school, I was thinking about the intimate day-to-day experience of caring for children and how overlooked it mostly is. Looking after young children is one of the hardest activities which we undertake in life, an activity still nearly exclusively carried out by women. The demands and sacrifices of motherhood on the whole go unacknowledged and unrewarded. Becoming a mother often means an extreme transformation in personal lifestyle, sacrificing the person you used to be, giving up freedoms that will never be regained. Motherhood has a long history of being represented from the outside with eminent male artists presenting an ideal figure, mostly within religious iconography. The Madonna is a ubiquitous figure, against which motherhood is experienced but the subjective mother’s voice is so often silenced and their subjectivity denied, especially within the arts. Making art as a mother or maybe even more specifically making art about being a mother is one of the hardest things to do and the prejudice against such an endeavour is widespread. In his 1938 novel Enemies of Promise Cyril Connolly asserted that "there is no more sombre enemy of good art than the pram in the hall". Attitudes have not shifted hugely since but Home Truths, being an exhibition about representations of motherhood, enfolds within it some bodies of work in which a female artist is representing herself as a mother, these are representations of maternal subjectivity. Taking into account the invisibility and silencing of the maternal voice within the arts, it is somehow no surprise that Sean O’Hagan’s review of the exhibition for The Guardian conveniently ignores that which is so often marginalised, and concentrates solely on the work of one of the two male artists in the exhibition, Leigh Ledare. Here is an artist, whose mother is so untypical as to verge on the monstrous, eternally damaging maternal figure, a mother conveniently fitting, albeit in an extreme and shocking form, the extenuated cliché of Madonna-whore complex. The other pieces in the show include four artists whose work can be said to successfully articulate maternal subjectivity. Ana Casas Broda, whose extensive body of work, Kinderwunsch, is represented in a large overwhelming photographic grid comprising images in which Casas Broda figures, collaborating with her children to create scenes in which the maternal body is surrendered. Using lighting which clearly identify the images as constructed dramatic performances, Broda’s presence is put forward as passive and thus shaped, molded, decorated and in turn transformed through the children’s activity. It speaks volumes of the inevitable requirement of the mother to relinquish her self, in sacrifice for the children, as the only way in which a creative practice can be continued and maintained. Elinor Carucci, known for her intimate and highly personal photographs, presents audiences with genuine family interactions staged for the camera to form a continuation of her practice of using family and private life as material for her art work from when she became pregnant and then a mother to twins in 2004. The works on show as part of Home Truth exhibition are a small selection of beautifully produced painterly prints that flirt with and challenge traditional maternal representations. Starting with a grotesque post-birth body, distorted, violated and bruised and following on with a photograph of Carucci in the bath with her struggling son trying to control and persuade him to bathe, the ideal of calm and serene motherhood is undermined. Using her signature spotlight aesthetic, which in the context of her ‘Mother’ series can also be thought to suggest the isolation experienced by mothers, through sleepless nights, with a crying child, in struggling with unreasonable behaviours (such as refusing to have a bath) Carucci’s maternal is made of extremes, tenderness, beauty and awe - coupled with a healthy and realistic helping of the abject. Katy Murray’s performance video piece Gazelle hovers precisely between pleasure and pain. The pleasure of recognition of perceptive and humorous representation of the maternal condition and the pain in acknowledging the impossibility of the heroic attempts involved in maintaining an art practice while caring for young children. It is heroic and ridiculous, painful and impossible all at the same time, not the elegant and graceful ideal of ‘having it all’ but a sweaty, puffing and panting, trying to balance and struggling to keep up picture of contemporary motherhood. Janine Antoni’s Inhabit, is presented as a large brightly coloured photograph, which also alludes to her performance taking place in her daughter’s bedroom. Evoking religious paintings, in which heavenly dwellers offer benevolent empathy to earthlings, and therefore suggesting links to the figure of the Madonna, Antoni’s mother does not float, but is instead harnessed and suspended by a web like structure in which her body is firmly held in balance, subjected to an identical pull from every direction. Surrounded by toys and children’s furniture, Antoni’s body is further encased in a fully furnished doll’s house within which a spider spins a web. In this condition, Antoni maintained the stillness required for the spider to successfully spin its web over a four-hour period. As such, the piece reflects on the emotional active passivity, an essential trait in mothering. Being a frame, a support, a scaffold, but without seeming too, enabling but pretending not to. Not so much ‘part of the furniture’ rather embedded in the very construction of the (doll’s) house. Bringing together these and other works under the umbrella of ‘motherhood and identity’ is in itself an important milestone, part of a post-feminist paradigmatic shift, and credit must be given to the show’s curator, Susan Bright, and by natural extension, The Photographers’ Gallery. Making explicit what it means to walk through the threshold and become a mother, Home Truths can be said to form part of a global process of change and, in the process, joins the confluence of the many small movements forming and developing, challenging and drawing attention to themselves and joining up to form a maternal voice. On Saturday 9 November our Editor-in-Chief, Tim Clark, will be taking part in a day of portfolio reviews at The Photographers' Gallery, London aimed at providing an opportunity for photographers and artists to receive advice from professionals who work in galleries and the magazine industry and are dedicated to contemporary photography. This is a rare opportunity to have your work looked at by editors and curators working in some of the top publications and spaces exhibiting photography in the UK. 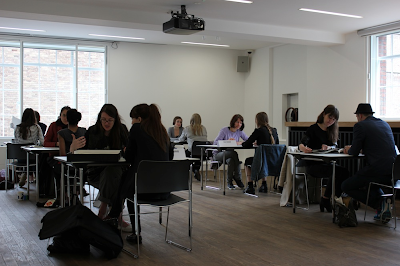 Each photographer will receive two, twenty-minute back-to-back sessions, between 10.00 and 17.00, with one member of staff from The Photographers' Gallery and one external magazine editor. A note from the organisers: The day is designed to support those wanting to develop their work for a magazine or exhibition context. We regret that we are unable to honour specific requests for reviewers or for specific times of day, and each individual may only book one place, which provides you with two reviews. The reviewers are interested in seeing all types of photographic work, be it conventional or experimental. Anne Bourgeois-Vignon commissions photography and film projects for print and web, both editorially and in the context of branded collaborations. Currently the Creative Content Director of NOWNESS, previously she has held roles as the Picture Director of Forward Publishing (London) and the Cultural Director of the photographers' agency INSTITUTE (New York). Her freelance photo editing work includes working for TIME Magazine and CondeNast Paris. She writes about photography and is developing a curatorial practice. Tim Clark is the editor-in-chief and director of the contemporary photography online magazine 1000 Words. His writings have appeared in The Sunday Times, The Daily Telegraph, FOAM, Time Lightbox, The British Journal of Photography and Next Level amongst other publications as well as in exhibition catalogues. He also regularly organises workshops with high-profile photographers such as Antoine d’Agata, Anders Petersen, Erik Kessels, Roger Ballen and Jeffrey Silverthorne in various cities across the globe. He has judged a number of awards and competitions, and in 2011 joined the Academy of nominators for the Deutsche Börse Photography Prize. He has also been invited to review portfolios at The Saatchi Gallery, FORMAT International Photography Festival, Les Rencontres d’Arles, New York’s International Center of Photography Career Day and FotoFest Houston. Clark has previously held positions at galleries in both the public and private sector including Michael Hoppen Gallery, London. Barry W. Hughes is a photographer, writer and publisher. His photography and video works have been published and exhibited internationally, including solo shows in Ireland, Germany and China. The founding editor/publisher of SuperMassiveBlackHole online photography magazine (SMBHmag), Hughes is a contributing writer to Hotshoe Magazine, and has curated exhibitions, reviewed portfolios and given talks for the likes of PhotoIreland Festival, Belfast Photo Festival, Belfast Exposed, Sirius Arts Centre and PhotoBook London. Poppy Shibamoto is the Photography Director of Monocle magazine, the global publication founded in 2007 covering international affairs, business, culture, design, fashion and lifestyle. Monocle believes in investing in quality journalism and generates original content, commissioning over 95% of its photography each month from photographers across the globe. Shibamoto commissions photography and produces shoots on a wide range of subjects: portraits, architecture, reportage, travel, still life and fashion. She is committed to working with photographers who are dedicated to story telling. Anna Dannemann gained an MA in Art and Visual History at the Humboldt-University Berlin, and has worked on different exhibitions and publications including projects at The Museum of Everything;Green Cardamom, London; Martin-Gropius-Bau and KW, Berlin. Among other projects, she has organised the graduate showFreshFaced+WildEyed 2013 and is currently working on an exhibition of the photographic work of the acclaimed writer and cult figure William Burroughs. Eva Eicker is a graduate of Ludwig-Maximilan University Munich, where she studied Cultural Anthropology and Goldsmiths College where she gained an MA in Photography and Urban Culture. She has worked on photography exhibitions and publications at C/O Berlin;Magnum Photos, London; Haus der Kunst, Munich; Hauser & Wirth, London and The Museum of Modern Art, New York City. Clare Grafik has worked on solo exhibitions with artists and photographers including Keith Arnatt, Lise Sarfati, Antoine D'Agata, Katy Grannan, Zineb Sedira and Taryn Simon. Group shows include a vidéothèque with the Cinémathèque de Tanger, The Photographic Object and, most recently, Perspectives on Collage. She has written for various publications including IANN, Contemporary, Art on Paperand Art Monthly. Karen McQuaid organised the talks and events programme from 2005 to 2008, and has worked on the exhibitions programme since 2008. Previous exhibitions include Vox Populi, London by Fiona Tan (2012); Open See by Jim Goldberg (2010) and an exhibition of studio work from the 50's and 60's by the Finnish photographer Claire Aho. Karen is currently working on an exhibition of the photographic work of the acclaimed writer and cult figure William Burroughs. £75 for two reviews, booking essential. For more information click here. "Sometimes an artist can have a greater sense of what they want in a more limited environment." So says Stephen Shore, a short documentary video by Heido Hartwig on whom we've decided to share here with you. In it he discusses how he came to photography, how he came to meet Andy Warhol and the importance of watching an artist make aesthetically based decisions at that stage in his life as well a glimpse at his new project shot in the Ukraine - highly charged photographers of Holocaust survivors and their surroundings.